Fall 2010 Anime Picks: There’s No Way My Little Sister Is This Cute! There are a couple of different ways to translate the title of this cute up-and-comer from the Fall 2010 anime season. Since the title is super long, I’m going to abbreviate it similarly to how I did KamiNozo and call it OreImo. However you find it and whatever it has been translated to, it is one of my top recommendations for this season. Kyousuke and his sister Kirino don’t get along very well at all and he often feels like he’s in her shadow. She gets excellent marks in school, she does part-time jobs to pay her way, she’s (usually) very polite and cheerful, and most of all she’s incredibly cute. But one day, after accidentally bumping into her in the hallway of their typical Japanese-turned-Western-style home, he finds a DVD for a magical girl anime. Even worse, he looks inside and the wrong disc is in the case — the disc seems to be a 18+ visual novel/dating sim game. It couldn’t be hers… could it? One day, Kyousuke catches his sister snooping around in his room. She was looking for the disc after all and very quickly snaps it away from him before storming out of the room. Unfortunately for him, that wasn’t the end of it. In the middle of the night he’s woken up with a slap to the face. His little sister would like to talk to him about something and she hopes that he won’t judge her harshly when she’s finished. It turns out that the disc was hers and is part of a large collection that she’s been hiding in her room. Her money from modelling jobs has been going to, among other things, anime box sets, collector edition 18+ games, figurines, manga, and light novels. Kirino is secretly an otaku! Weirder still, she seems to have a fixation for the “little sister” genre but insists that it’s just because she thinks the heroines are cute. Kyousuke is blown away but true to his promise he doesn’t judge her harshly (though admittedly her obsession with “little sister” games does creep him out a bit). And so starts a series of episodes in which, in her own catty way, Kirino asks for guidance and advice on troubles in her “second life”. As her older brother and the only other person who knows her secret, it’s quite a burden for him. Can he bear it? As I wrote above, the show once again gives otaku a nod in a very novel and tasteful way. 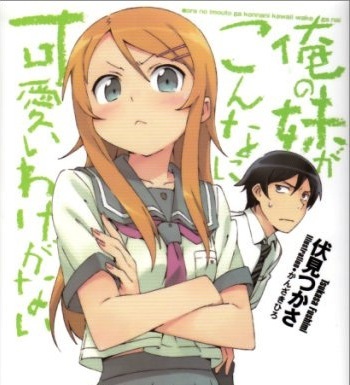 Considering the recent deluge of “moeblobs” targeting the same market, OreImo is a breath of fresh air. The character designs are really good and Kirino is super cute. The message that otaku come from many different places is endearing and the show treats some topics regarding how society sees otaku and how they see themselves. I’m just as creeped out as Kyousuke is sometimes, and find myself thinking “is this really happening” every single time Kirino’s relationship with her older brother and her “little sister” games fandom are juxtaposed. The show remains tasteful but every so often it skirts the line. Strongly recommended, particularly if you like otaku stuff but have gotten tired of moeblobs and harem shows. Unlike KamiNozo, OreImo is less focused on particular clichés and tropes of otakudom and more focused on the bigger picture. This entry was posted on at 11:30 pm	and is filed under Japan.